Our REAlease Fluorochrome Technology was awarded with the technology prize at the Pharmaceutical Flow Cytometry & Imaging 2018 conference in Stevenage, UK. Delegates of the European Laboratory Research & Innovation Group (ELRIG) nominated our technology, underlining its importance for biotechnology and pharmaceutical research. The principle of releasable antibody fluorochrome conjugates. 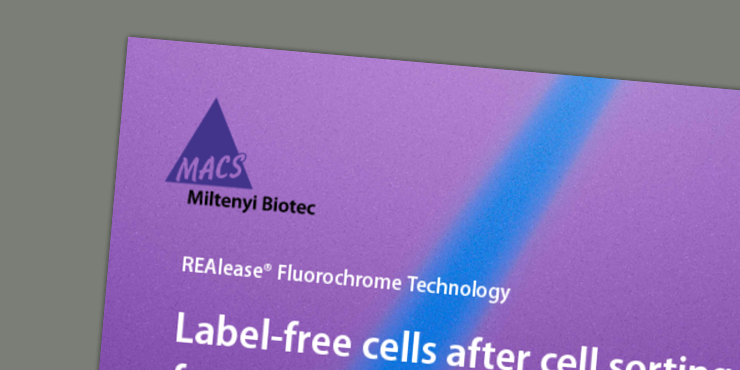 REAlease Fluorochrome Technology allows for removal of any labels from the cells after cell sorting in just one step. 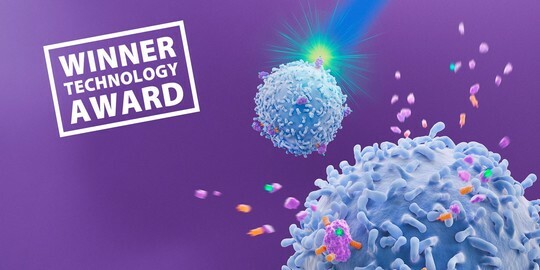 The technology relies on recombinantly engineered antibody fragments that are, unlike conventional antibodies, characterized by low epitope binding affinities. A novel covalent conjugation approach allows for multimerization and fluorescent labeling of these antibody fragments. They form the so called REAlease Fluorochrome Complex which facilitates high-avidity cell binding that is comparable to conventional fluorochrome conjugates. This novel and innovative conjugation chemistry allows for fast removal of the REAlease Fluorochrome Complex from the cell surface by adding the REAlease Release Reagent after cell sorting. This leads to disruption of the complex and thereby results in monomerization of the antibody fragments. Due to their engineered low binding affinity, they spontaneously dissociate from the cell surface. As a result, label-free cells can be obtained after cell sorting providing maximal flexibility for a wide range of applications. Staining and release performance of REAlease Antibodies. The staining performance of REAlease Antibodies is equivalent to conventional antibodies with comparable brightness and low non-specific binding. The removal of REAlease Antibodies is highly efficient and selective with no detectable fluorescence signal remaining after the release step. Additionally, the labeling efficiency in the relabeling step is equivalent to the initial staining demonstrating that epitopes become completely available again. For release and relabel with REAlease Antibodies refer to the REAlease Support Kit. Staining and release performance of REAlease Antibodies. Human peripheral blood mononuclear cells (PBMCs) were stained with REAlease Releasable Antibodies (A) or conventional antibodies (B) targeting CD4 and conjugated to different fluorochromes. All samples were also counter-stained with conventional CD3 antibodies. 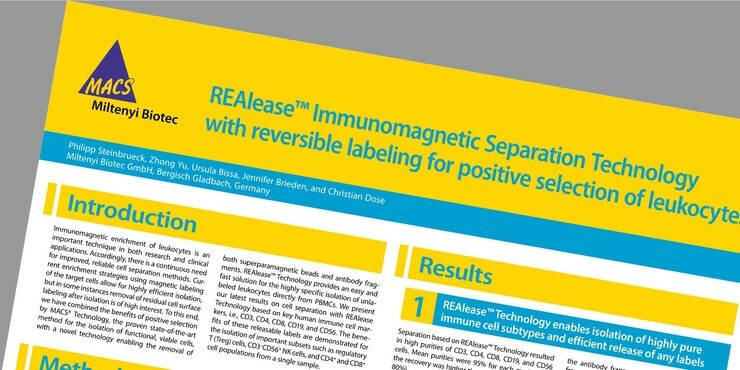 REAlease Antibodies were efficiently released using the REAlease Release Reagent (C) and successfully relabeled (D) using the same REAlease Releasable Antibodies targeting CD4. All samples were analyzed by flow cytometry on the MACSQuant® X. The new covalent conjugation chemistry of the fluorochrome conjugates allows a reversible multi-parameter cell labeling. To demonstrate the versatility of this technology, we developed REAlease Fluorochrome Conjugates for several cell markers that can be used for multiparameter panel stainings of e.g. pan T cells. 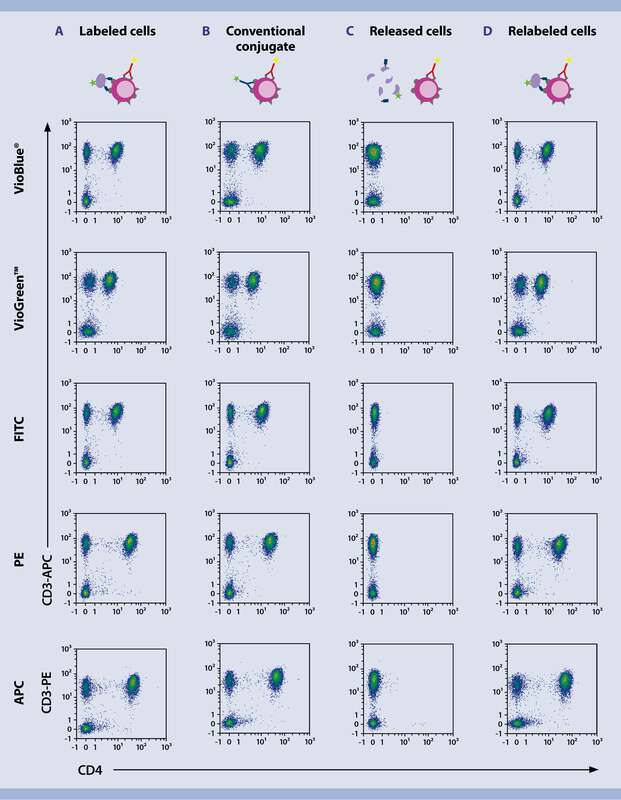 In this example, five-parameter cell labeling of peripheral blood mononuclear cells (PBMCs) with REAlease Fluorochrome Conjugates allows for clear definition and discrimination of T cell subsets. After the addition of the REAlease Release Reagent all fluorochrome conjugates can efficiently be released. Multiparameter immunofluorescent labeling and release. One peripheral blood mononuclear cell (PBMC) sample was used as starting material for a five-parameter panel labeling of different T cell subsets. Labeling with releasable antibody fluorochrome conjugates resulted in efficient staining. Subsequent release using the REAlease Release Reagent yielded completely unlabeled cells. In this webinar learn about our REAlease Fluorochrome Technology. In just one step, it allows for removal of any labels from cells after cell sorting.